James Puxley was born in 1948. He was educated in Berkshire before attending the University of Bristol where he obtained a BA degree in history. Following a year working as an apprentice in the Englefield Estate Office near Reading he attended the Royal Agricultural College, Cirencester where he obtained a diploma in rural estate management. This was followed by two years practical work which enabled him to become qualified as a chartered surveyor in the rural division of the Royal Institution of Chartered Surveyors. He worked in this field for a number of years. In the 1980s he started to manage the Welford Estate, near Newbury on behalf of his mother and then on his own behalf when she transferred ownership to him. He continues in this role today. Mr Puxley was High Sheriff of the Royal County of Berkshire from 2000 to 2001. He was appointed a Deputy Lieutenant in 2005 and became Vice Lord Lieutenant in 2010. Mr Puxley is a farmer and former President of the Royal Berkshire Show. He has given good service to a range of charities and voluntary organisations in Berkshire and beyond, including the Community Foundation, the Police Rehabilitation Trust, the Watermill Theatre, the Country Land and Business Association and his local Young Farmers Club. He is a former Chairman of the Anglo-American Community Relations Committee for West Berkshire and is an Honorary Commander of RAF Welford, a small American base located near his home in the west of the county. He has been vice chairman of his local Parish Council and sits on his local Parochial Church Council. At various times throughout his life he has indulged his passion for travel, embarking on several long distance expeditions, and has travelled widely on most continents. Travel has taken him to counties that are difficult to visit as a tourist at the present time such as Iraq, Iran and Afghanistan. He continues to take a great interest in foreign affairs. Mr Puxley lives at Welford Park near Newbury with his wife, Deborah. They have two children, a son and a daughter. The Lord-Lieutenant is the permanent representative of the Queen in Berkshire. It is an honorary appointment. Mr Puxley was appointed as Lord-Lieutenant in January 2015. His predecessor, Mrs Bayliss, was in post from 2008 to 2015. The Lord-Lieutenant attends The Queen, Members of the Royal Family and visiting heads of state during visits to the County and makes all the arrangements for their visits. 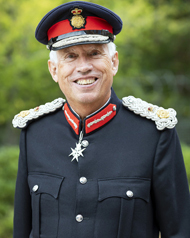 In general Lord-Lieutenants follow the example of The Queen in promoting a good atmosphere and a spirit of co-operation in all walks of life in the County. In particular they encourage voluntary activity, voluntary service and charitable organisations. They also take an interest in the business, commercial and social life of the County.